The stylish staple of Danish minimalism turns 60 this year. 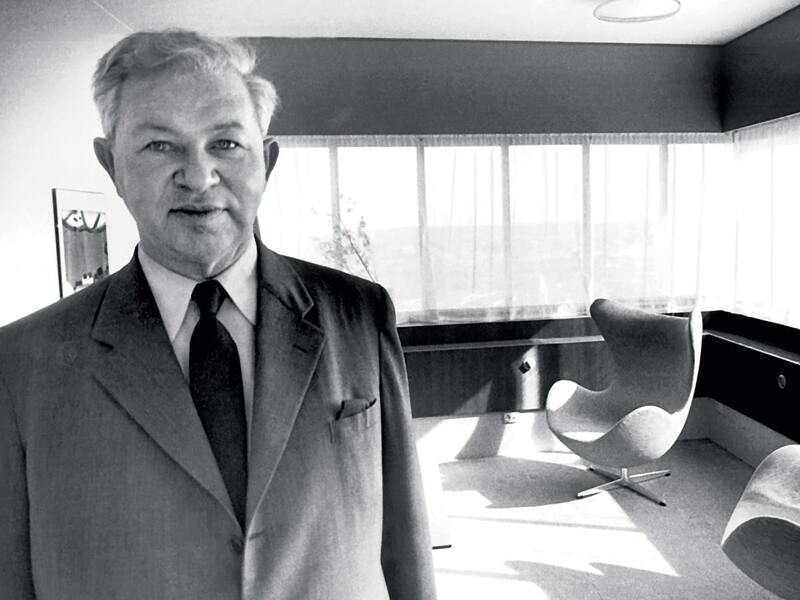 It was the steel-framed seat that launched a million imitations: Danish architect Arne Jacobsen (1902-71) created his iconic Egg chair six decades ago. A beloved touchstone of midcentury modernity and pop, the ubiquitous Egg is the cozy yet streamlined piece Jacobsen crafted for his SAS Royal Hotel in Copenhagen (now the Radisson Blu Royal Hotel), the city’s first skyscraper. Though it would look perfect on the set of Mad Men, the Egg, with its sweeping curves, semiprivacy and ability to move (it both tilts and swivels) is still timely (or timeless), continuing to spell jet-set hospitality. Indeed, the chair appeared to great fanfare in San Francisco Airport’s Terminal 2 more than a half century after Fritz Hansen began producing it. Jacobsen grew up in Copenhagen to parents whose pursuits signaled function and form: His father sold safety pins and snap fasteners, while his mother painted as a hobby. The young architecture student began winning prizes for chair design in 1925, when he took a silver medal at an art deco fair in Paris. Jacobsen soon scored prestigious residential commissions and even ruffled some feathers for his ultramodernist homes, but his thriving career was interrupted when he was forced into exile to escape the Nazis—he was aided by the Danish resistance—during World War II. He later returned to Denmark with a roar. Though he designed houses, faucets and lighting (the last in collaboration with Louis Poulsen), Jacobsen became most associated with his sinuous chairs; indeed, the Swan chair, also produced for the SAS Royal Hotel, became nearly as famous as the Egg. Available at Design Within Reach and Luminaire, the Egg chair can be wrapped a dozen dierent ways, from aqua fabric (shown here) to chartreuse and from walnut leather to cowhide.